Guru Tera Singh Holds a B.A. in Psychology with a focus in Psychobiology and Psychoneuroimmunology, with a minor in Holistic Health. Guru Tera has been practicing Yoga since 1985, and has teaching since 1995. He has studied both Hatha Yoga at San Francisco State University, and Kundalini Yoga with the International 3HO (Happy, Healthy and Holy) Organization of Yogi Bahjan. In 1995 Guru Tera completed the Kundalini teachers training course taught by Dev Inder at the Guru Ram Das Ashram in San Francisco. 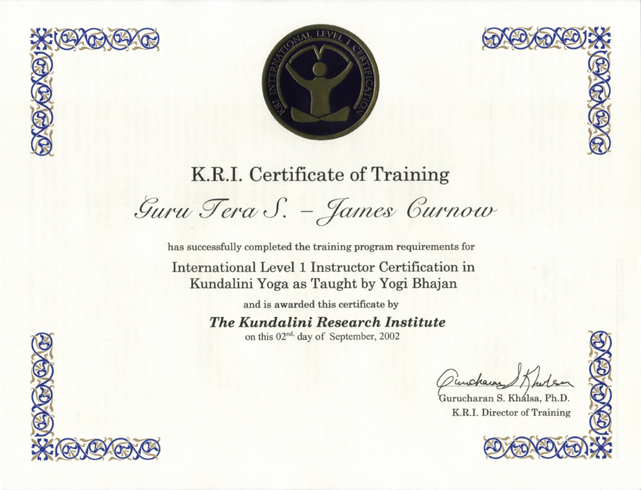 In 2002 Guru Tera was awarded Yoga Instructor Certification for successful completion of the International Kundalini Yoga Teacher Training Level 1. He also brings a wide knowledge from studying Aikido, Biofeedback, Computer Science, Ceremonial Magic and a wide sampling of metaphysics. Adesh Singh has been involved in Kundalini Yoga for over ten years and has been teaching since he graduated from the IKYTA Teacher Training Level 1 Certification program in 2002. Mark has also been involved in the study of Astrology, Tarot, Ceremonial Magic, Shamanism an Holistic Health for over 20 years and has studied Psychology and English as the University of Illinois at Chicago. Guru Tera and Adesh have found that blending Yogic Technology into their lifestyle has been a major catalyst in improving their well being and maintaining a focus on spiritual pursuits. Both have made personal commitments to act as a bridge between the LGBT and Yogic communities as a way to transcend differences and realize the commonality that we all share. Kundalini Yoga provides it's practioners with the opportunity to experience inner harmony and the interconnectedness common to all beings.